Can someone suggest a video or a link for instructions on how to replace a starter motor on a 2002 Honda Accord? Is this the 4 or 6 cyl Accord? Either way it is pretty straight forward to replace. Do you have a volt meter? If so, pull the small wire from the solenoid and test for voltage when someone tries to start the car/key to "start". We tested the old starter. The starter shaft didn't engage, bot it spun. I installed the new starter, charged the battery and the engine doesn't turn over. The oil in the engine us ok so I don't think it's frozen. 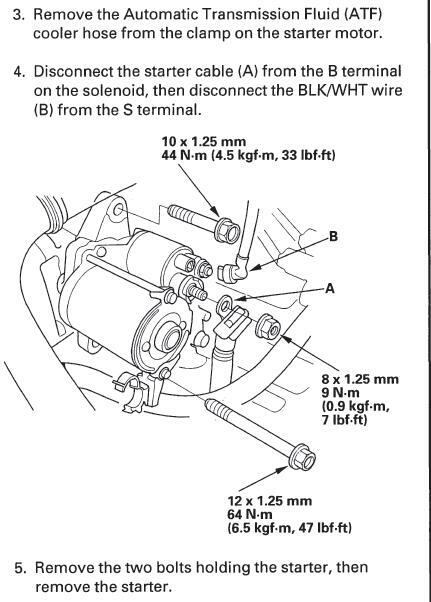 Are you getting ~12v on the small wire to the starter solenoid when you turn the key to "start"? There isn't 12V to the small wire with the switch on or off. There's 12 volts to the big wire with the switch on. Also, I have the small wire connected, I have a red connector going to one of the posts on the starter. Lastly, I have a black cable on the starter connected to itself. So can we confirm how many cables connect to the starter? 2 or 3? The small wire should have 12v when you try to "start" the engine. If you are not getting 12v to the small wire to the solenoid when trying to start the engine something "up the circuit" is wrong. How about the black wire on the stud? There should be a small wire with a "spade"/push on style connector....that is the solenoid wire. This is from a 6 cyl, the 4 cyl is almost the same......See the arrow to "B". Is this the 4 or 6 cyl.....if a 4 is it a manual or auto?